According to a report from The U.S. Department of Housing and Urban Development (HUD), approximately 100,000 households own the Naples home they live in, while approximately 40,000 to 50,000 of the households rent their homes. 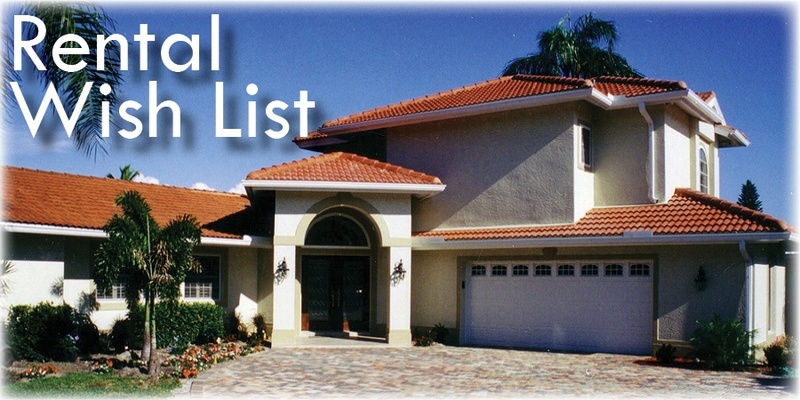 There are a lot of rental properties in the Naples area—and you may own one of them. Whether you rent out a house to snowbirds during the winter or to someone year-round, it’s important to get the right renters for your property. So what are renters really looking for? Here’s a look at the top renovation features to include if you’re renting the space out. We did a little digging to find out what renters have on their “Wish List” when it’s time to choose a property. A number of common features kept surfacing. So if you’re planning a renovation or remodel of your Naples rental property, here are some things to keep in mind. Move-in Ready Status: Renters want to be able to move in when they are ready. They don’t want to wait for fixes or “freshening.” Remember that first impressions matter. Open Floor Plans: Not surprisingly, the same trends that apply to owner-occupied homes apply to rentals. Renters want open space, easy access between common rooms and lots of natural light—just as homeowners do. Storage Space: When people rent, they still need space to store their stuff. Having places to store clothing and other items makes the place feel more like home. When remodeling, consider ways you can add storage space without adding to the house’s footprint. Updated Bathrooms and Kitchens: Renters tend to focus on some of the same things that homeowners do when selecting a property. Updated kitchens and bathrooms tend to get a lot of attention. That doesn’t mean going overboard, but you’ll want “current” countertops and fixtures. You may not have to worry about style so much, but you’ll want something that will look current and that will stand up to normal wear and tear. Built-in Laundry: It doesn’t feel like home for a renter if he or she has to lug laundry to the Laundromat. Having a dedicated laundry room (or laundry space) is a big plus for renters. You may even want to consider furnishing the washer and dryer. Outdoor Area: You probably don’t want to go overboard in preparing recreational outdoor space for your renters. However, having a nice patio area or even a simple deck can help attract the kind of renter you want. It doesn’t have to be flashy—just well done. Security: Everybody likes to feel safe and secure at home—whether they own it or not. Making sure that front and back doors are solid and have secure, robust locks makes a home feel more secure. Why go to the trouble of renovating a place where you aren’t even going to live yourself? The fairly obvious answer is that it makes your property more desirable and easier to rent. It also makes it possible to ask a higher rental price. But there’s another aspect that may not be quite as obvious at first glance. More desirable properties tend to generate interest from a more desirable group of renters. Those who are attracted to (and can afford to pay for) a nicer property are more likely to treat it with respect and keep it clean. There is also a better chance that you’ll retain your renters longer. It’s much easier on your house (and on you) to have one renter for several years than it is to have multiple renters. One last thing to consider is that all of these improvements and enhancements are also things that will help you command a higher price if you ever decide to put your rental property up for sale. It’s helpful to think of these things not just as “costs” to be weighed against rental income, but rather as investments in your property that will pay you back when it’s time to sell.